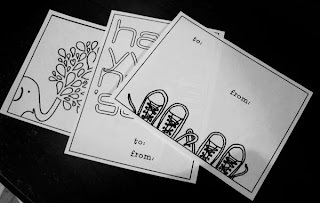 So here are the (free) printable Valentines my 1st-grader chose for her class. We printed them out (four to a page) on slightly textured cardstock; since she wanted mostly elephants and just one page of sneakers, I simply selected those pages in the print instructions. She absolutely loves to color and spent a good hour carefully coloring and writing out names on a couple dozen of these beauties. Print out your own at Up Up, The Blog.